Anti-Pattern: Sharing page objects, using your UI to log in, and not taking shortcuts. 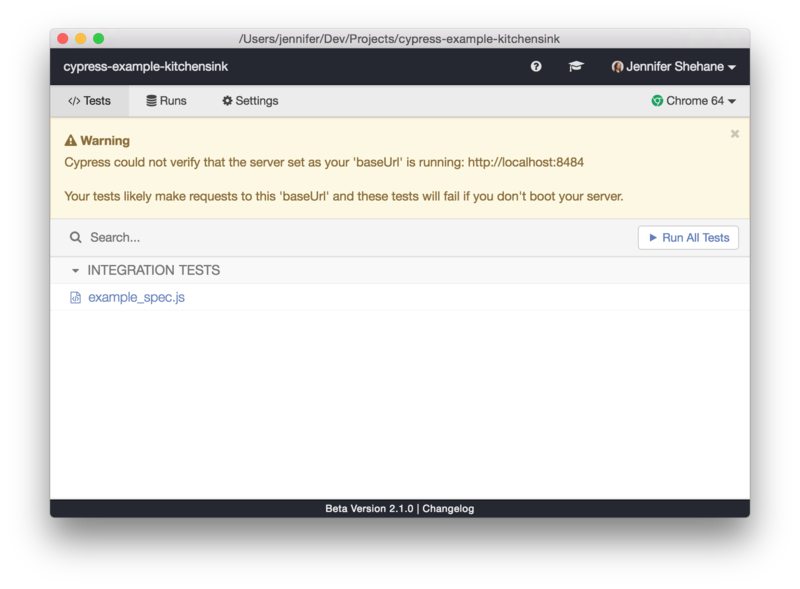 Best Practice: Test specs in isolation, programmatically log into your application, and take control of your application’s state. In February 2018 we gave a “Best Practices” conference talk at AssertJS. This video demonstrates how to approach writing fast, scalable tests. Anti-Pattern: Using highly brittle selectors that are subject to change. Best Practice: Use data-* attributes to provide context to your selectors and insulate them from CSS or JS changes. Every test you write will include selectors for elements. To save yourself a lot of headaches, you should write selectors that are resilient to changes. Luckily, it is very easy to avoid both of these problems. cy.get(&apos;button&apos;).click() Never Worst - too generic, no context. cy.get(&apos;.btn.btn-large&apos;).click() Never Bad. Coupled to styling. Highly subject to change. cy.get(&apos;#main&apos;).click() Sparingly Better. But still coupled to styling or JS event listeners. cy.contains(&apos;Submit&apos;).click() Depends Much better. But still coupled to text content that may change. cy.get(&apos;[data-cy=submit]&apos;).click() Always Best. Insulated from all changes. Targeting the element above by tag, class or id is very volatile and highly subject to change. You may swap out the element, you may refactor CSS and update ID’s, or you may add or remove classes that affect the style of the element. Instead, adding the data-cy attribute to the element gives us a targeted selector that’s only used for testing. The data-cy attribute will not change from CSS style or JS behavioral changes, meaning it’s not coupled to the behavior or styling of an element. Additionally, it makes it clear to everyone that this element is used directly by test code. The Selector Playground automatically follows these best practices. If I should always use data attributes, then when should I use cy.contains()? If the content of the element changed would you want the test to fail? If the answer is no: then use a data attribute. The question is: how important is the Submit text content to your test? If the text changed from Submit to Save - would you want the test to fail? If the answer is yes because the word Submit is critical and should not be changed - then use cy.contains() to target the element. This way, if it is changed, the test will fail. If the answer is no because the text could be changed - then use cy.get() with data attributes. Changing the text to Save would then not cause a test failure. Anti-Pattern: Trying to assign the return value of Commands with const, let, or var. Best Practice: Use closures to access and store what Commands yield you. Many first time users look at Cypress code and think it runs synchronously. // THE WAY YOU THINK IT DOES. You rarely have to ever use const, let, or var in Cypress. If you’re using them, it’s usually a sign you’re doing it wrong. If you are new to Cypress and wanting to better understand how Commands work - please read our Introduction to Cypress guide. You’re trying to store and compare values such as text, classes, attributes. You’re trying to share values between tests and hooks like before and beforeEach. For working with either of these patterns, please read our Variables and Aliases guide. Anti-Pattern: Trying to visit or interact with sites or servers you do not control. Best Practice: Only test what you control. Try to avoid requiring a 3rd party server. When necessary, always use cy.request() to talk to 3rd party servers via their APIs. One of the first things many of our users attempt to do is involve 3rd party servers in their tests. Testing log in when your app uses another provider via OAuth. Verifying your server updates a 3rd party server. Checking your email to see if your server sent a “forgot password” email. Initially you may be tempted to use cy.visit() or use Cypress to traverse to the 3rd party login window. It is incredibly time consuming and slows down your tests. The 3rd party site may have changed or updated its content. The 3rd party site may be having issues outside of your control. The 3rd party site may detect you are testing via a script and block you. The 3rd party site may be running A/B campaigns. Let’s look at a few strategies for dealing with these situations. Many OAuth providers run A/B experiments, which means that their login screen is dynamically changing. This makes automated testing difficult. Many OAuth providers also throttle the number of web requests you can make to them. For instance, if you try to test Google, Google will automatically detect that you are not a human and instead of giving you an OAuth login screen, they will make you fill out a captcha. Additionally, testing through an OAuth provider is mutable - you will first need a real user on their service and then modifying anything on that user might affect other tests downstream. Stub out the OAuth provider and bypass using their UI altogether. You could just trick your application into believing the OAuth provider has passed its token to your application. If you must get a real token you can use cy.request() and use the programmatic API that your OAuth provider provides. These APIs likely change more infrequently and you avoid problems like throttling and A/B campaigns. Instead of having your test code bypass OAuth, you could also ask your server for help. Perhaps all an OAuth token does is generate a user in your database. Oftentimes OAuth is only useful initially and your server establishes its own session with the client. If that is the case, just use cy.request() to get the session directly from your server and bypass the provider altogether. We have several examples of doing this in our logging in recipes. Sometimes actions that you take in your application may affect another 3rd party application. These situations are not that common, but it is possible. Imagine your application integrates with GitHub and by using your application you can change data inside of GitHub. After running your test, instead of trying to cy.visit() GitHub, you can simply use cy.request() to programmatically interact with GitHub’s APIs directly. This avoids ever needing to touch the UI of another application. Typically, when going through scenarios like user registration or forgotten passwords, your server schedules an email to be delivered. The easiest way to check that this happened is likely with a unit or integration test at the server level and not at the end-to-end level. You generally do not need to test things only your server interacts with like side effects and services. Nevertheless, if you did want to write a test in Cypress, you already have the tools to do this without involving the UI. You could cy.request() an endpoint on your server that tells you what email has been queued or delivered. That would give you a programmatic way to know without involving the UI. Your server would have to expose this endpoint. You could also use cy.request() to a 3rd party server that exposes an API to read off emails. You will then need the proper authentication credentials, which your server could provide, or you could use environment variables. Anti-Pattern: Coupling multiple tests together. Best Practice: Tests should always be able to be run independently from one another and still pass. You only need to do one thing to know whether you’ve coupled your tests incorrectly, or if one test is relying on the state of a previous one. Simply put an .only on the test and refresh the browser. If this test can run by itself and pass - congratulations you have written a good test. If this is not the case, then you should refactor and change your approach. Move repeated code in previous tests to before or beforeEach hooks. Combine multiple tests into one larger test. Let’s imagine the following test that is filling out the form. What’s wrong with the above tests? They are all coupled together! If you were to put an .only on any of the last three tests, they would fail. Each test requires the previous to run in a specific order in order to pass. Now we can put an .only on this test and it will run successfully irrespective of any other test. The ideal Cypress workflow is writing and iterating on a single test at a time. This above example is ideal because now we are resetting the state between each test and ensuring nothing in previous tests leaks into subsequent ones. We’re also paving the way to make it easy to write multiple tests against the “default” state of the form. That way each test stays lean but each can be run independently and pass. Anti-Pattern: Acting like you’re writing unit tests. While technically this runs fine - this is really excessive, and not performant. It is common for tests in Cypress to issue 30+ commands. Because nearly every command has a default assertion (and can therefore fail), even by limiting your assertions you’re not saving yourself anything because any single command could implicitly fail. Anti-Pattern: Using after or afterEach hooks to clean up state. Best Practice: Clean up state before tests run. We see many of our users adding code to an after or afterEach hook in order to clean up the state generated by the current test(s). Let’s look at why this is not really necessary. One of the best parts of Cypress is its emphasis on debuggability. Unlike other testing tools - when your tests end - you are left with your working application at the exact point where your test finished. This is an excellent opportunity for you to use your application in the state the tests finished! This enables you to write partial tests that drive your application step by step, writing your test and application code at the same time. We have built Cypress to support this use case. In fact, Cypress does not clean up its own internal state when the test ends. We want you to have dangling state at the end of the test! Things like stubs, spies, even routes are not removed at the end of the test. This means your application will behave identically while it is running Cypress commands or when you manually work with it after a test ends. If you remove your application’s state after each test, then you instantly lose the ability to use your application in this mode. Logging out at the end would always leave you with the same login page at the end of the test. In order to debug your application or write a partial test, you would always be left commenting out your custom cy.logout() command. For the moment, let’s assume that for some reason your application desperately needs that last bit of after or afterEach code to run. Let’s assume that if that code is not run - all is lost. That is fine - but even if this is the case, it should not go in an after or afterEach hook. Why? So far we have been talking about logging out, but let’s use a different example. Let’s use the pattern of needing to reset your database. After each test I want to ensure the database is reset back to 0 records so when the next test runs, it is run with a clean state. Here is the problem: there is no guarantee that this code will run. If, hypothetically, you have written this command because it has to run before the next test does, then the absolute worst place to put it is in an after or afterEach hook. Why? Because if you refresh Cypress in the middle of the test - you will have built up partial state in the database, and your custom cy.resetDb() function will never get called. If this state cleanup is truly required, then the next test will instantly fail. Why? Because resetting the state never happened when you refreshed Cypress. The simplest solution here is to move your reset code to before the test runs. Code put in a before or beforeEach hook will always run prior to the test - even if you refreshed Cypress in the middle of an existing one! This is also a great opportunity to use root level hooks in mocha. A perfect place to put these is in the cypress/support/index.js file because it is always evaluated before any test code from your spec files. Hooks you add to the root will always run on all suites! That’s it! It couldn’t be simpler! Is resetting the state necessary? One final question you should ask yourself is - is resetting the state even necessary? Remember, Cypress already automatically clears localStorage, cookies, sessions, etc before each test. Make sure you are not trying to clean up state that is already cleaned up by Cypress automatically. If the state you are trying to clean lives on the server - by all means, clean that state. You will need to run these types of routines! But if the state is related to your application currently under test - you likely do not even need to clear it. The only times you ever need to clean up state, is if the operations that one test runs affects another test downstream. In only those cases do you need state cleanup. Anti-Pattern: Waiting for arbitrary time periods using cy.wait(Number). Best Practice: Use route aliases or assertions to guard Cypress from proceeding until an explicit condition is met. In Cypress, you almost never need to use cy.wait() for an arbitrary amount of time. If you are finding yourself doing this, there is likely a much better, simpler way. Waiting here is unnecessary since the cy.request() command will not resolve until it receives a response from your server. Adding the wait here only adds 5 seconds after the cy.request() has already resolved. Waiting for the cy.get() below is unnecessary because cy.get() automatically retries until the table’s tr has a length of 2. Whenever commands have an assertion they will not resolve until their associated assertions pass. This enables you to simply describe the state of your application without having to worry about when it gets there. Alternatively a better solution to this problem is by waiting explicitly for an aliased route. Anti-Pattern: Trying to a start a web server from within Cypress scripts with cy.exec() or cy.task(). Best Practice: Start a web server prior to running Cypress in the Test Runner or headless mode. We do NOT recommend trying to start your backend web server from within Cypress. Any command run by cy.exec() or cy.task() has to exit eventually. Otherwise, Cypress will not continue running any other commands. Every time your tests run, you’d have to work out the complexity around starting an already running web server. Why can’t I shut down the process in an after hook? Because there is no guarantee that code running in an after will always run. While working in the Cypress Test Runner you can always restart / refresh while in the middle of a test. When that happens, code in an after won’t execute. Start your web server before running Cypress and kill it after it completes. Are you trying to run in CI? We have examples showing you how to start and stop your web server. Anti-Pattern: Using cy.visit() without setting a baseUrl. Best Practice: Set a baseUrl in your cypress.json file. Adding a baseUrl in your configuration allows you to omit passing the baseUrl to commands like cy.visit() and cy.request(). Cypress assumes this is the url you want to use. Adding a baseUrl can also save some time during the initial startup of your Cypress tests. When you start running your tests, Cypress does not know the url of the app you plan to test. So, Cypress initially opens on https://localhost + a random port. As soon as it encounters a cy.visit(), Cypress then switches to the url of the main window to the url specified in your visit. This can result in a ‘flash’ or ‘reload’ when your tests first start. By setting the baseUrl, you can avoid this reload altogether. Cypress will load the main window in the baseUrl you specified as soon as your tests start. Having a baseUrl set gives you the added bonus of seeing an error if your server is not running at the specified baseUrl when you open Cypress.